J. Narayana Rao from Nagpur, India traveled throughout his country during space week speaking with students about the need to oppose the weaponization of space. During Keep Space for Peace Week an intensive awareness campaign was undertaken in which I have traveled more than 7,000 kilometers addressing students, faculty members and public figures in four universities (Nagpur, Srinagar, Jalgaon and Andhra) and six colleges in the States of Maharashtra, Andhrapradesh and Jammu-Kashmir) and eight meetings in the colleges at Srinagar, Anantnag in J&K State, Jalgaon and Nagpur in Maharashtra, Parvtipuram, Srikakulam, Veeraghattam and Visakhapatnam in Andhrapradesh. In addition to these two meetings one each organized by the Intellectual Forum at Jammu and one by the Lions Club at Parvatipuram. In the meetings in the Universities the presence of highly qualified professors and lecturers helped to take the issue of danger of weaponization of space and Missile Defense program into the academic circles. The meeting at the North Maharasshtra University at Jalgaon was presided over by the Vice Chancellor himself. In the Colleges in Andhrapradesh and Jammu-Kashmir the students and the staff members heard for the first time about the issue of weaponization of space and the Missile Defense program. At Parvatipuram, which happens to be my birth place which I left 50 years back, both in the college and in the public meeting organized by the Lions Club I had to speak in my mother tongue and the audience heard with an unbelievable sense of amazement. In Sringar my meetings were in two Government Women’s Degree colleges at Srinagar and Anantnag. After the meetings students flocked around me and expressed their desire to work with me. I immediately formed two groups of students. The professors and the lecturers at all the places have expressed their desire to be in touch with me and involve in the campaign against weaponization of Space. Brochures and DVDs supplied by the Global Network (GN) office were given at all the places. I am now planning how to consolidate the opportunities this tour provided. I requested them to be in touch with Bruce Gagnon and use the website of the GN. During this campaign, to involve the students in a large numbers, I have organized a nationwide letter writing campaign for the college students and the subject was a “Letter to U.S. President George W. Bush” urging him to initiate action for abolition of nuclear weapons and stop the weaponization of space. One hundred seventy-five students from different colleges of Goa, Meghalaya, Kashmir, Bengal, Maharashtra, Andhrapradesh, Karnatak, Manipur have responded and the letters were written in English, Hindi, Telugu, Urdu, Bengai, Kannada, Ashmiri and Marathi languages. I had sent the invitation to 300 institutions. Now I am trying to form student groups in some of the colleges. 1. Regularly to be in touch with colleges/ Universities which responded. 2. Organize a series of workshops for the students and academicians. 3. Create a band of activists. 4. Regularly publish the bi-monthly “Disarmament & Development” newsletter with material from GN and other international organizations. But there are some hurdles such as the lack of financial support, tedious train and bus traveling, lack of resource persons, and absence of reading material in local languages. Nevertheless seeds are thrown and I have deep convictions these seeds will sprout and grow. As part of his 7000 km. journey by bus and train to support the United Nations Outer Space Treaty and Keeping Space for Peace, J Narayana Rao travelled to Anantag, Srinigar and Jammu in Jammu-Kashmir. "After the meetings students flocked around me and expressed their desire to work with me. I immediately formed two groups of students." He also wrote of his "campaign to involve the students in large numbers, I have organized a nationwide letter campaign for the students." The ". . .subject was a 'Letter to U.S. President George W. Bush' urging him to initiate action for abolition of nuclear weapons and to stop the weaponization of space. One hundred seventy-five students from different colleges of Goal, Meghalaya, Kashmir, Bengal,Maharashtra, Andhrapradesh, Karnatak, Manipur have responded and the letters were written in English, Hindi, Telugu, Urdu, Bengal, Kannada, Ashmiri and Marathi languages. I had sent the invitation to 300 institutions. 25 students received 100 Rupees each for their prize winning letters. Now I am trying to form student groups in some of the colleges." Regularly to be in touch with colleges/ Universities which responded. Organize a series of workshops for the students and academicians. Create a band of activists. Regularly publish the bi-monthly “Disarmament & Development” newsletter with material from GN and other international organizations. To sustain the students curiosity and interest organize regular Nationwide Competitions." "But there are some hurdles such as the lack of financial support, tedious train and bus traveling, lack of resource persons, and absence of reading material in local languages. Nevertheless seeds are thrown and I have deep convictions these seeds will sprout and grow." AIPSO and the G. C. College of Commerce held a seminar jointly on the importance of the United Nations deciding every year to observe the 2nd of October every year as a day of non-violence. J. Naranya Rao was one of the speakers. The link was also made to keeping space for peace. After the seminar there was a rally at the Gandhi statue in Nagpur, and garlands were strung upon it. These meetings brought information to the above groups on the dangers of space militarization and the need for all of us to support keeping space for peaceful uses. At North Maharashtra University the Vice Chancellor himself presided over the meeting and both students and highly qualified professors and lecturers joined in the discussion. Nagpur is the current home base of J. Narayana Rao and he met with students and professors, as well as women concerned with peace and development, on the dangers of missile defense and space weaponization programs. He writes that he will continue to work with these and other groups in Nagpur in the spirit of Gandhi to organize against the twin threats of an arms race in space and nuclear weapons development. J. Narayana Rao travelled to Madhya Pradesh in support of peaceful uses of space. In this case the local organizer failed to arrange the planned events, and the expected meetings did not take place. However he met with local peace activists and discussed ways in which Indians can non-violently resist their nation's involvement in space militarization. J. Narayana Rao writes "At Pavaratipuram, which happens to be my birth place that I left 50 years back, both in the SVD college and in the public meeting organized by the Lions Club I had to speak in my mother tongue and the audience hard with an unbelievable sense of amazement." Students were among those joining in a letter campaign on this subject. J. Narayana Rao met with students and faculty at the Sri Sai Junior Science College in Veeraghattam. He writes that "students and faculty heard for the first time about the issues of missile defense and space weaponization. Here as elsewhere students and faculty were eager to keep in touch and learn more." He gave them DVDs and brochures from the Global Network. To All India Peace & Solidarity Organization and Trade Unions and address to a science college. At these meetings in the coastal area of Andra Pradesh J Narayana Rao writes that he left "Brochures and DVDs supplied by the Global Network (GN) offices" as he did at all organizations and colleges where he spoke during his 7,000 km journey to urge that we all take responsibility for keeping space for peace. In this area students had never before heard of space militarization and its dangers. 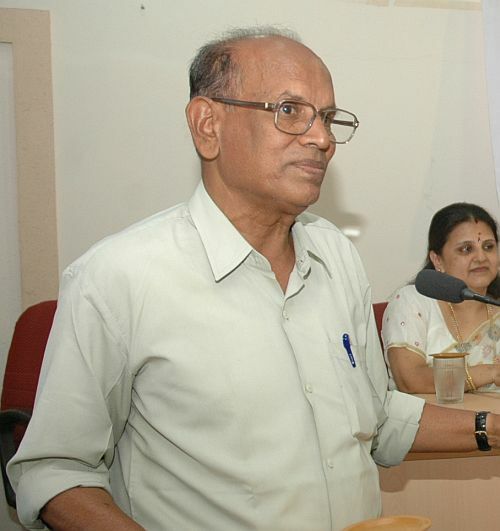 J. Naranya Rao brought his message and information on the dangers of space militarization to students and faculty of Andhra University, one of the foremost universities in India with strong programs in science and engineering. He also attended the inaugural meeting of a new chapter of the Indian Women for Peace and Development and again referred to the need to take individual responsibility for keeping space for peace and preventing Indian involvement in space militarization and an arms race in outer space.